The Leader of Aniocha North Legislative Arm in Delta State, Hon. Ekene Origin Nwaonye has cried out to the general public intimating them that his life, that of his wife and his entire family are in serious danger. Hon. 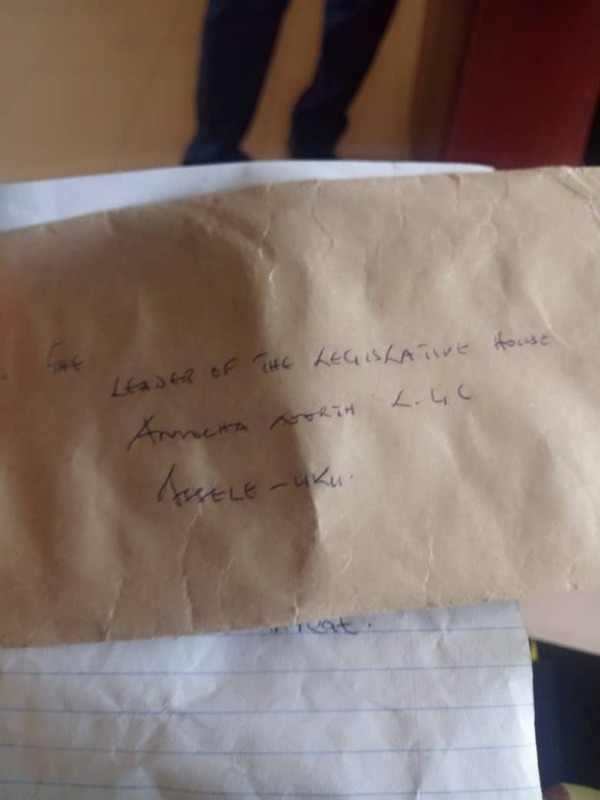 Nwaonye who disclosed this to Journalists on Monday, April 15, 2019 at Asaba, the Delta State Capital, said that a warning letter addressed to the Leader of Aniocha North Legislative Arm was found by him at the porch of his house at Issele-uku, on Sunday evening on his way back from his vacation. He said that on opening the letter, he was shocked to read a three short paragraph warning him to withdraw the vote of no confidence passed by the Aniocha North Legislative Arm on the Chairman of the Local Government and the Clerk of the Legislative Arm, threatening that if he fails to do so himself, his wife or members of his family woul be kidnapped and dealt with severely. “You know the security situation in the country as a whole, based on this, I had to immediately report the matter to the Issele-Uku Divisional Police Headquarters, and the Issele-Uku office of the State Security Services, SSS where the matter has been taken note of. “I have gone further by calling on the members of the press this afternoon and through you to the general public to let you all know that my life, that of my wife and members of my family are in danger,” Hon. Nwaonye stated. 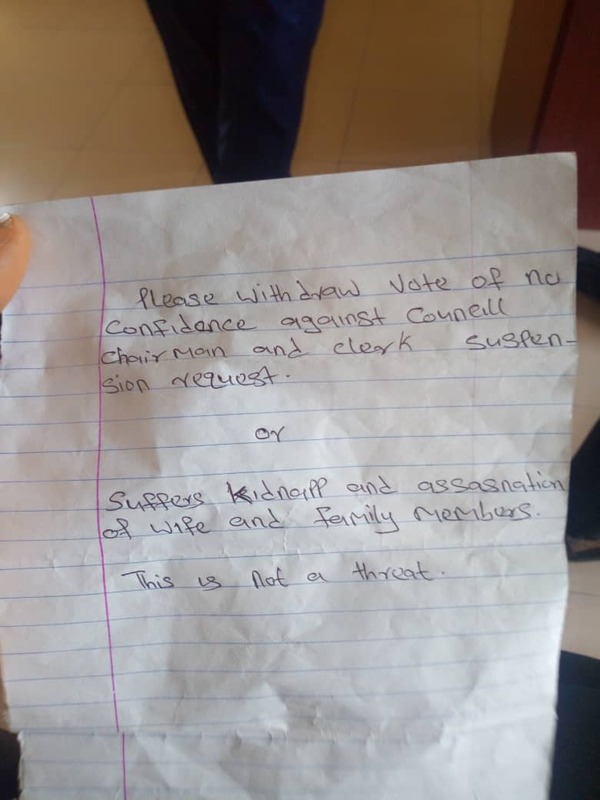 On who could be responsible for that letter and the motive, the Leader of the Aniocha North Legislative Arm noted that it is the Job of the security agencies to find out. He however explained that as councilors representing various wards in the local government area, they were elected by the people to be their eyes and ears in the Aniocha North Local Government and to speak on their behalf; hence as the Leader, he has been leading members of the legislative Arm to do just what they were elected to do. “But It is obvious that the Chairman of the Local Government, Hon. Chuks Oseme, in spite of the fact that the people need me and others to work for them, does not in any way want me to be at the Local Government not to talk of being the Leader of the Legislative Arm’’. “So, he has been doing everything within his powers to do away with me, not knowing that power is given through the instrumentality of the Almighty God,” Nwaonye said and went further to explain how the chairman of the Local Government has been using a civil servant who is the Clerk of the Legislative Arm to frustrate the activities of the legislative Arm, adding that the Clerk’s impunity has gone to the extent of convening the sitting of the Legislative Arm without the directive of the Leader. “You will recall that on the 13th of November, 2018 the Legislative Arm of Aniocha North Local Government, passed a vote of No confidence on the Executive Chairman of the Local Government, having witnessed unprecedented fraudulent practices and persistent violations of due process,” the Leader stated and made available a copy of a document addressed to the Speaker of the Delta State House of Assembly petitioning the State House of Assembly on the matter. In the document titled, “Vote of No Confidence on Honourable Oseme Chukwugoziem, Executive Chairman Aniocha North Local Government Council, Issele-Uku and Request for Investigation”, they listed 21 indictments on the Executive Chairman of the Local Government and prayed the House through the Speaker to come to their aid by setting up an investigative panel of inquiry, relying on section 131 sub section 11 paragraph 1 of the Delta State Local Government Law 2013 as amended. They also prayed for four other things which included the removal of the Clerk of the Legislative Arm from office for complicity and dereliction of duty. The document was signed by the Leader, the Deputy Leader and Chairman, Finance and Appropriation Committee and copied to the Honourable member representing Aniocha North State Constituency in the State House of Assembly, Hon. Engr. Emeka Nwaobi. Hon. Ekene Nwaonye further revealed that with the intervention of the State Governor, Senator Dr. Ifeanyi Okowa, who in his magnanimity resolved the matter, a kind of truce was reached and we thought that with the intervention of the Governor, the Chairman will run the affairs of the council in line with due process, but all to no avail, instead his impunity was taken to another height. Nwaonye in his brief to the members of the press stated that the Chairman in his bid to frustrate him and the activities of the Legislative Arm, took full control of the Clerk who now takes directives from him instead of the leadership of the Legislative Arm, thereby bringing the activities of the Arm to nothing. “it was based on this ugly development that the House in its sitting of 21st February, 2019 passed a vote of No confidence on the Clerk and requested for her suspension for reasons listed in this Document which I will hand over to you”, he stated. The Leader also disclosed that on the same 21st February, the house because of the exigency of the general election resolved to go on recess to reconvene on the 18th of April, noting that the resolution was as usual forwarded to the Chairman for his information. He noted that before they recessed, the Chairman of the Council did not in any way bring up the issue of the Presentation of the 2019 proposed Budget estimate of the Local Government until he traveled out, having duly handed over to his Deputy. “It was on Wednesday 27 March 2019 while we are on recess that members received a text message from the Clerk, that a Vote of No Confidence has been passed on me by the House, calling members for sitting with regard to 2019 Budget Estimate. “Members were asking, if it was not the Clerk that they no longer have confidence on and at the same time wondering if the Chairman was not aware that the House was on recess. Okay, accepted that it was an emergency situation, did the Chairman called the Leader or the Deputy leader’s attention on the need to convene the House. Why bringing the Honourable House to disrepute? There are many ways for him to reach us and accord us our due respect and regard, but he chose to dishonour us, using the clerk and her husband who is not even from Aniocha North”, Hon. Nwaonye Stated. He disclosed that having reported the Clerk to the Delta State Local Government Service Commission on the resolution of the House, the Legislative Arm has also resolved not to carry on any more legislative activities until the Clerk is removed and replaced. “This is the reason they want to kill me, my wife and members of my Family, but the security agencies have been duly informed and My God is able”, he concluded. A call was put across to the Delta State Police Command through the PPRO, DSP. 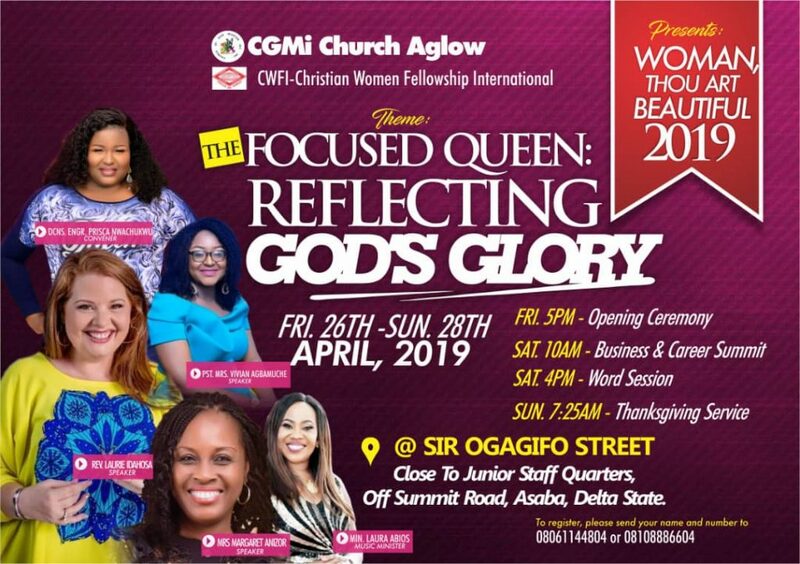 Onome Onovwakpoyeya, who responded that she was out of town and referred us to her Assistant, ASP Orisewezie who said that the command has not received any information regarding the subject matter.